First, I thank Chartfag for his list, and for assembling information. Also Moetron who put most of the information I used. The list is the V.1, so it's still incomplete. 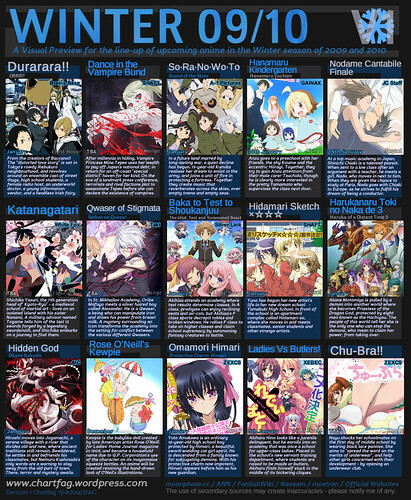 But it show most of the interesting anime for the new season. However, my post is incomplete, I will only show anime that interested me. Anime like chu-bra, I will pass quickly on it or won't be in the post. 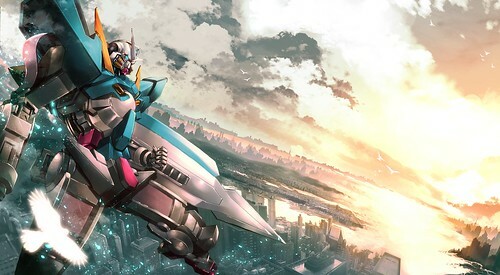 Another point, some movies are released in November like Macross ~Itsuwari no Utahime~ or Eden of the East : King of Eden movie I, it's still in fall so it won't appear in the post. If you are a faithful visitor, I suppose you notice the new design of the blog. From Orange/Fushia/Pink, we change into Blue sky/Sapphire. I was surprised ...I didn't wait it at all. I wait more Unicorn than 00 gundam movie. Well in the trailer, we can have a little peek into the design and animation that look retro. For the moment, since I saw the trailer in bad quality, I can't judge but I can just say it's have good movement and it's fluid. I was totally charmed by the design, totally my type ^^ I love and for mecha-design, it's the same effect (specialy the Kshatriya, the big green one).